Looking For A Reliable Refrigerator Repair Company? Your Refrigerator is possibly the most important appliance in your home. It is also the most used (It’s always on)! Proper care and some preventative maintenance will allow your Refrigerator to work efficiently and trouble free for many years. 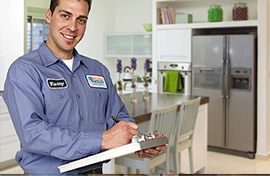 At Rush Hour Appliance Repair, we know there’s never a convenient time to have household or kitchen appliance issues. That’s why our goal is to provide quality appliance repair service in a timely manner. Available for 24 Hr emergency service.